The best lists never die. The SMART mnemonic has been around for at least half a century, per Wikipedia. 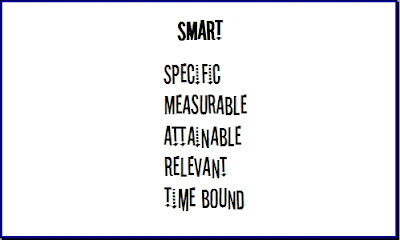 SMART is similar to INVEST, evaluating criteria for goals and objectives instead of for stories. SMART has generated many different word expansions over the years. Sometimes M is meaningful, manageable, or even motivational(!). Our Agile in a Flash card uses the supposedly preferred words. But as a result of this inconsistency, I struggled yesterday to recall the best choice for the letter R. "Realistic?" No, that's too close in meaning to attainable. A quick search revealed relevant (duh!). I supplanted my mild self-annoyance (at my inability to remember the better choice) with elation at the prospect for a new, relevant agile card! In the context of agile, I've found SMART goals to be useful when discussing action items to come out of retrospectives. True, there's no reason these couldn't be treated just like INVEST stories. But I've found that selling something half-a-century-tried-and-true can be a little easier with some crowds. Here are my thoughts about the relevance of the SMART criteria with respect to retrospectives. Measurable - Attainment of our specific example goal might be validated by answering some questions: What was the average number of stories completed within two to three days? How many stories did not complete in this time? You can think of iterations as fixed time periods in which to run experiments; you can express a hypothesis that validates or disproves the value of each experiment by capturing relevant data. Attainable - It's important that a team can check off completed goals, to reinforce the sense of achievement. Obviously goals that your team can complete in an iteration best meet this criterion, but you don't want to have only short-term goals. There's nothing wrong with long-term goals; just make sure there's a way to measure incremental progress. Relevant - Too many trivial goals can give a bloated sense of achievement. Shortening daily stand-up meetings by limiting them to five minutes might seem beneficial, but does it really change anything? What's the real problem? Don't hesitate to attempt dramatic changes, and don't hesitate to think outside the box that pseudo-agile dogmatists might otherwise paint you in. Time bound - Like stories, many teams tend to have a problem with letting things creep past iteration boundaries. "We just need a little more time." Set up the experiment, define completion and success criteria, and grade the experiment: it was either completed or abandoned, and the hypothesis either held true or was disproved. Hi, I came to this post via a web search, and have a suggestion for those like me unfamiliar with your theme: highlight the word "story" since you use it in a particular sense relevant to Agile Dev. It took me awhile to figure this out. thanks for the suggestion Marku! We sometimes forget that the audience for this blog isn't necessarily versed in agile terminology.